A traditional Georgian design demilune or half round sideboard or served is mahogany with a shimmering inlaid matched flame grain "sunburst" top and satinwood and ebony marquetry and banding. A brass plate is engraved, "Brian Andrew, Ltd," a notable design studio in the Merchandise Mart in Chicago, IL. About 15 years old, the renewed finish is in excellent condition. There are two drawers with curved fronts, one is divided for wine bottles. 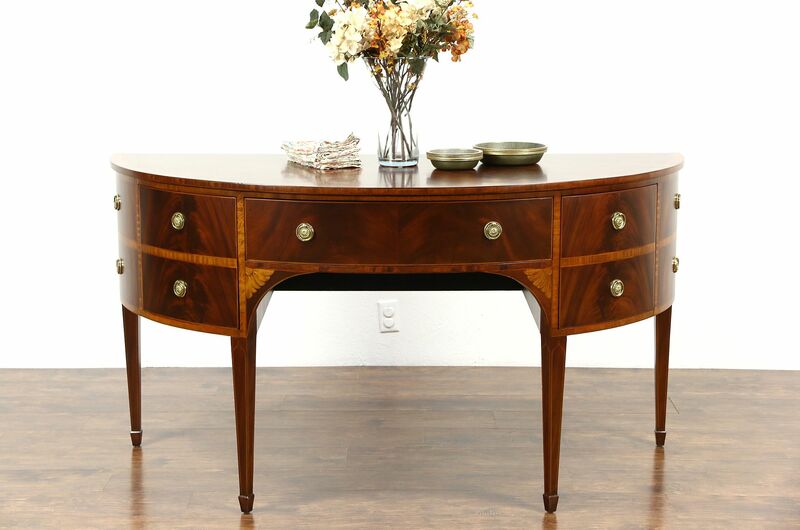 Solid brass ring pulls are original on this elegant vintage furniture. Dimensions are 65" wide, 30" deep and 35" tall.